Mike Concannon ’22 dribbing away from Vassar’s defense. Image courtesy of Ross Ladue. 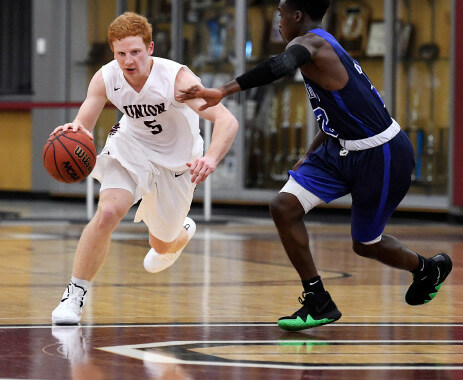 On Friday, January 18, Union men’s basketball team played against Vassar College where the Dutchmen picked up a big Liberty League victory with the score of 65-60. Four Dutchmen scored double figures on Friday’s game. Mike Concannon ’22, Kevin McNoble ’19, Jackson Mannix ’21, and Kevin Jefferson ’20. Mike Concannon played 25 minutes in the game, he scored 13 points at Vassar’s game which was more than his current average 10.9 points per game. Concannon scored 3-5 three pointers which improved his 3FG percentage to .431 per game, also. Mike scored 5-8 field goals with a result of .625 percent that is his second-best field goal percentage per game, correspondingly his FG percentage improved to .439 percent. Kevin McNoble played 32 minutes in the game scoring 15 points, the highest scorer on Friday’s game, Kevin scored 5-12 field goals, 2-7 three-point field goal, and 3-4 free throw goals. In consequence, Kevin had 5 steals, 12 field goal attempts, 7 three-point field goal attempts beating his personal records and recording new season highs. Sophmore Forward Jackson Mannix played 36 minutes in the game scoring 11 points against The Brewers. Mannix scored 4-23 field goals with a percent of .333, 3-8 three-point field goals with a percent of .375. Jackson had 8 rebounds and 1 block which helped the Dutchmen stay on top of the Brewers. Junior point guard Kevin Jefferson scored 10 points, which is 1point below his average points per game. Jefferson scored 2-6 field goals with a percent of .333, 2-5 three-point field goals with a percent of .400, and 4-4 free throw points with a percent of 1.00, his personal best free throw percentage. Kevin also beat his average turnovers per game with two turnovers and his average steals per game with one steal. In the first half, the Dutchmen made 13-26 field goals with a percent of .500 which was higher than Vassar’s .36 percent , 4-15 three-point field goals with a percent of .267, 4-4 free throws with a percent of 1.00. The Dutchmen finished the game with 22-55 field goals with a percent of .40, but the defense gave a strong performance limiting Vassar to 23-60 which is .383 percent, lower than the Dutchmen. The Dutchmen made 6 -12 three-pointers and 7 – 9 free throws in the second half to take home the victory. The Dutchmen will face Skidmore college on the 25 of January at 7 p.m. in Saratoga Springs.